Dial 016 from any telephone (various languages spoken). Link here to Spanish social security web page in English. Useful support site for those with teenagers. Click here to visit the web site. Dr Susan Jeffers is an international bestselling author of self-help books about fear, confidence, relationships, self-esteem and parenting. Click here to visit her web site. An introduction to the award-winning Louise L Hay’s video. To watch the video, click here. Samaritans in Spain offers a free, completely confidential non- judgmental telephone-based emotional support help-line service for any English speaker of any age who may be experiencing distress or despair, and who might be feeling suicidal. We believe that whatever problems someone may have, whether big or small, they do not have to be alone with them. The helpline is on 900 525 100 and is open 24 hours a day, 365 days of the year. Click on the image to visit the website. 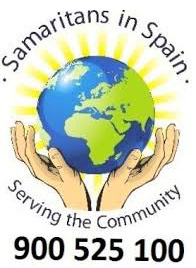 A friendly, non-religious, non-profit making group that meet weekly in Moraira, Spain to discuss and learn about all things of a spiritual, mystical or metaphysical nature. Click here to visit their website. Click here to visit the website of the British Embassy in Spain with lots of information and help for UK Citizens living abroad. Known as the “Home Day and Night Plan” this tariff gives 10% off electricity used between 23:00 and 13:00 the following day summer time and 22:00 and 12:00 winter time. Energy used outside these hours is 20% higher than standard rate. You can apply online by following the link to the website below but it is often best to go in to the Iberdrola office and sign up there. There is a one-off charge to change the meter (around 25€). This tariff is also available from other suppliers. To visit the Iberdrola website, click here. Many of the banks who have repossessed properties in Spain are unable to sell them and are renting them out to get income. Rents are fairly low in comparison to private landlords. The link here is to Solvia but other banks also operate Oportunidades sites too. Fed up with all of those pesky telemarketing calls? This is the Spanish equivalent of the Telephone Preference Service (TPS) in the UK. Once on the list, you should stop receiving calls within a few weeks. The site is only in Spanish but is easy to register with, click here to visit the website.